One of the biggest concentrations of theme parks in the United States is found in and around Anaheim. To help you decide which parks are the best for you and your family, we’ve rounded up the top destinations. The queen bee of Southern California’s theme parks, Walt Disney’s original attraction in Anaheim is known for its themed lands, including Fantasyland, Tomorrowland® Area, and Main Street, U.S.A., where you’ll find legendary rides like Space Mountain and Dumbo the Flying Elephant®. Disneyland® Park's modern sister theme park is located right next door. It features thrill rides and attractions based on Disney and Pixar characters from the Little Mermaid to Toy Story to Guardians of the Galaxy. Movie magic awaits at this combo studio, theme park, and entertainment complex where you can get an insider look at how movies and TV shows are made, plus enjoy rides themed around the Harry Potter films, Jurassic Park, and other blockbusters. Don’t let the name fool you—what was once a berry farm is now a major amusement park with roller coasters, family rides, Wild West shows, and entertainment featuring Snoopy and other Peanuts characters. The Knott’s Berry Farm water park, located adjacent to the amusement park, provides plenty of ways to cool off, with twisting waterslides, drop slides, a wave pool, and a lazy river. Part amusement park and part aquarium, SeaWorld features roller coasters and family rides but is better known for its animal shows, where you can learn about dolphins and sea lions while watching them perform tricks. 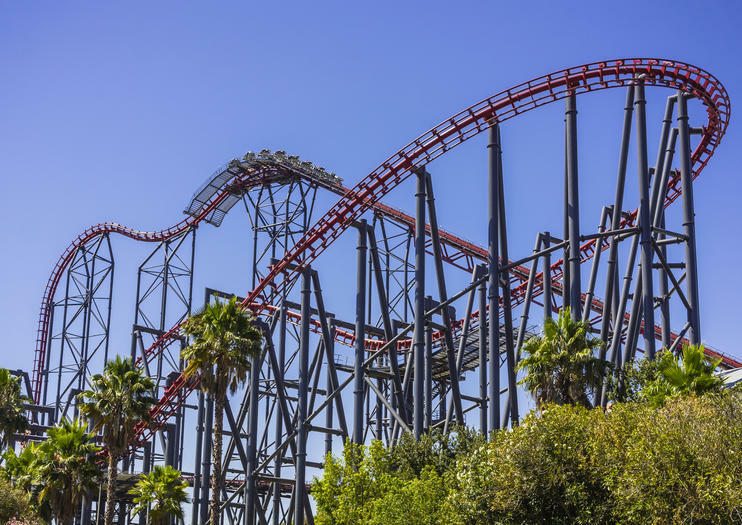 This classic amusement park north of LA boasts more than a dozen roller coasters and other thrill rides, including some of the world’s tallest and fastest, with nods to Batman, Superman, and Justice League characters. North of San Diego, kid-focused Legoland is home to family rides and activities themed around everyone’s favorite building blocks. It also features a water park. Located in Anaheim, this amusement park is one of the smallest in the area, with rides and attractions that come with much shorter lines than the bigger parks.